Bring the long, morning walks through leaf coated fields of Harvest Time to life with this range of colourful and warming fragrances and this Autumn Night Medium Jar from Yankee Candle, part of the Harvest Time range of fragrances. 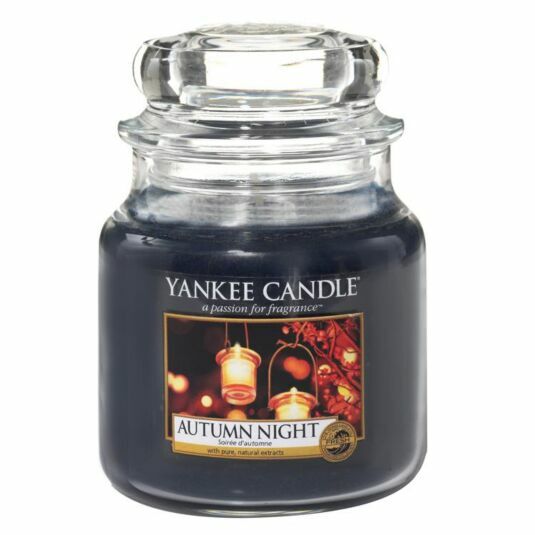 The Autumn evenings invites with brisk earthiness and dreamy interludes of lavender and woodland notes. Top notes of Bergamot, Grapefruit and Black Peppercorn mingle with middle notes of Lavender and Maple Leaf and base notes of Vetiver and Oak. This medium classic jar candle has a burn time between 65-90 hours and reflects a fresh and tropical sense of style that’s always at home, be it in the bedroom, the bathroom, the living room, or anywhere else you see fit. A fabulous gift for a friend or a treat for yourself.